Awesome! Jupiter is one of my all-time favorites, and I’m planning on writing a LOT about it once it gets just a little higher in the evenings. I am also a huge proponent of photographic experimentation. I have a long post I need to transfer from my old blog about photographing the moon with a point-and-shoot digital camera and a pair of binoculars. That worked far better than even I expected. Thanks for stopping in and commenting. Keep us posted on your further adventures. Would you lose ALL your remaining respect for me if I told you that I attempted this mission last night and failed? True: I couldn’t find the triangle. Heck, no! I’m proud of you for trying…and pleasantly surprised that you did. Seriously, though, you’re a lot farther north than I am, which means that the pole star is higher in the sky and everything else is shifted south. I punched up the just-after-dark sky from southern England in Stellarium and everything is much closer to the zenith than it is here. The picture in the post makes it look like you gaze off to the east to see the triangle. Even here, it’s much more like cranking your head back and looking straight up to find Vega, and looking slight down left and right to pick up Deneb and Altair. Also, these directions are for just after dark. If you go outside closer to midnight, everything in the sky will have rotated around to the west. 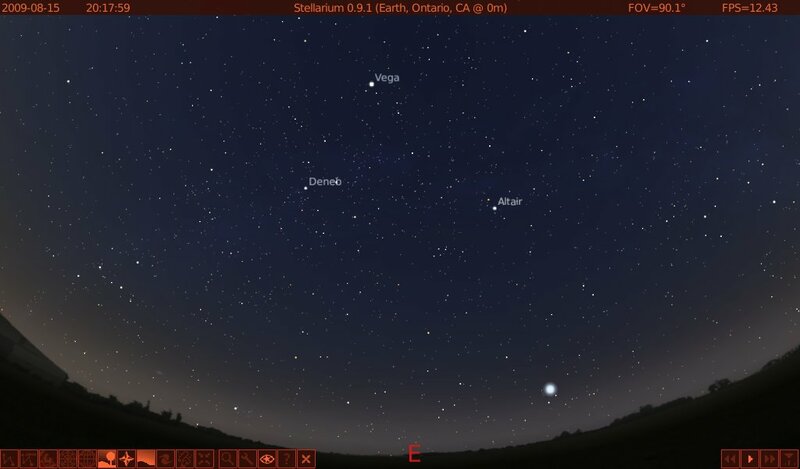 I am torn on whether or not to do a post on sky motions; it would be simpler to just have you fast-forward in Stellarium and see what happens. Did you punch this up in Stellarium before you went outside? I know, asking you to do so somewhat defeats the point of having blog posts that supposedly do all the work for you. But I use Stellarium like this all the time. In fact, since the Summer Triangle stars are all bright and you don’t need much dark adaptation to see them, you can put Stellarium into night mode and carry your laptop outside with you. It’s worth taking the time to find these, because there are some Summer Triangle goodies coming up in Mission 3. Sadly, Mission 2 is probably out for you, considering your high latitude and that big hill south of your house. Ooh, snarky! No, it wasn’t a cloudly night. I could see plenty of stars, just not the right ones. If I have a chance tonight, I’ll look higher up. Ironically, I am about to go swanning off to Spain for the best part of a fortnight, so I’ll see a noticably different set of stars — still, that ought to make the triangle easier, not harder. “Rotated round to the west” — I’m not sure what direction that is, given that the triangle starts out in the east. Do you mean it’s moving to the north or the south? I installed Stellarium, but it didn’t work — long wait while it loaded shedloads of data, textures, etc., and then after all the mounting excitement, it seggy-faulted. (That’s like a General Protection Fault, for you Windows people.) I don’t have time to look into this right now. Much more south than north. Remember that the stars rise in the east and set in the west, just like the sun, and for the same reason. Everything appears to rotate around the pole star, which is much higher in the sky where you’re at. For someone at the Equator, the stars appear to pass almost directly east to west across the dome of the sky. For someone at the North Pole, the pole star is directly overhead and the stars just make circles in the sky without either rising or setting, except for those very close to the horizon. For those of us in between, the stars (and sun, moon, planets, etc.) rise in the east, arc around southwards, and set in the west, except for the circumpolar stars that are close enough to the pole star to be above the horizon all the time. Much more to say on that another time. Okay, seriously, I know you’re about to leave on vacation and don’t have time to deal with this right now. As an emergency patch, you could dig out the “Binocular Highlights” book I left last fall, which has good sky maps and ought to cover sky motions at least briefly. If that’s too inconvenient, download the Getting Started in Astronomy guide from Sky & Telescope, print it out (only 12 pp. ), and take it with you on vacation. You’re right, from Spain you will see many more southern stars and the moon, planets, etc. will be higher in the sky and easier to see. When you do leave and return? I might be persuaded to get some moon/planet posts up early if they’d be of any use to you while you travel. Oh, and don’t forget to take your binoculars! That’s just good vacation advice, whether you plan on stargazing or not. Har! It WAS the Linux version. Not tried it on the Mac yet.